I have been making stoneware pottery since 1985. Paul Eshelman at Eshelman Pottery in Elizabeth, Illinois, was my pottery college instructor while attending North Central College in Naperville, IL where I received a BA double major in Art and Physical Education in 1987. My pottery forms are influenced by the work of Robin Hopper and John Leach. I enjoy bringing beauty to functional pottery through intricate stamping, contrasting textures with glazes, and surface relief carvings and sculpture. 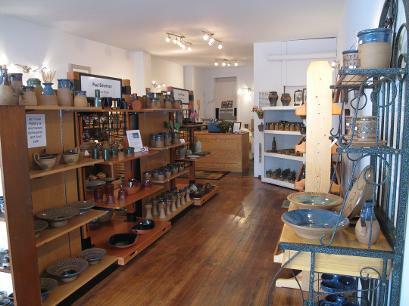 Pinder Pottery & Gallery opened on Main Street in historic downtown Galena, IL in the spring of 2013. The Pottery classes are centered around teaching basic and advanced skills of hand building and wheel throwing. These are one on one workshop style lessons where students will receive direct teaching and guidance during the entire lesson. This is a five-day course. Price $750.00. Learn to create a slab mug, slump mold vessel, wall pocket & more! Advanced class projects and lessons will be skill set to the students level of learning. Classes are limited to 4 participants and include clay, glazes, and additional studio hours as needed. This is a five-day course. Price $750.00. Learn the basics of wheel-thrown pottery and create unique vessels! Advanced class projects and lessons will be skill set to the students level of learning, including the basics of sculpture. Class is limited to 1 participant and include clay, glazes, and additional studio hours as needed. Fifth day glazing scheduled two weeks from the 4th class.